This trip turned out to be bigger than my words, and larger than my photographs. One blog post will not suffice. So this first one will cover some basic facts. I’m considering a second one that would cover my impressions. However, my impressions were huge, and I might decide that the second post will also not suffice. In that case I’ll recognize that I am unable to communicate this trip, and abandon the cause. Either way, here are at least a few basic facts. The beginning of it all is that my first grandchild was born in February, and Mrs. Pondero and I schemed a fall trip to Silver Spring, MD to visit. Having plenty of time for scheming, the visit grew into a grandson/family/old friends/bike tour/new friends whirlwind. Mrs. Pondero and I spent Saturday, Sunday, and Monday with my grandson, Titus (and his parents). Then my good friends Steve and Cindy Butcher arrived Monday evening in time for dinner and prepare for a morning tour departure. Our nucleus group consisted of me, my friend Steve, and my son-in-law Carey Jones. 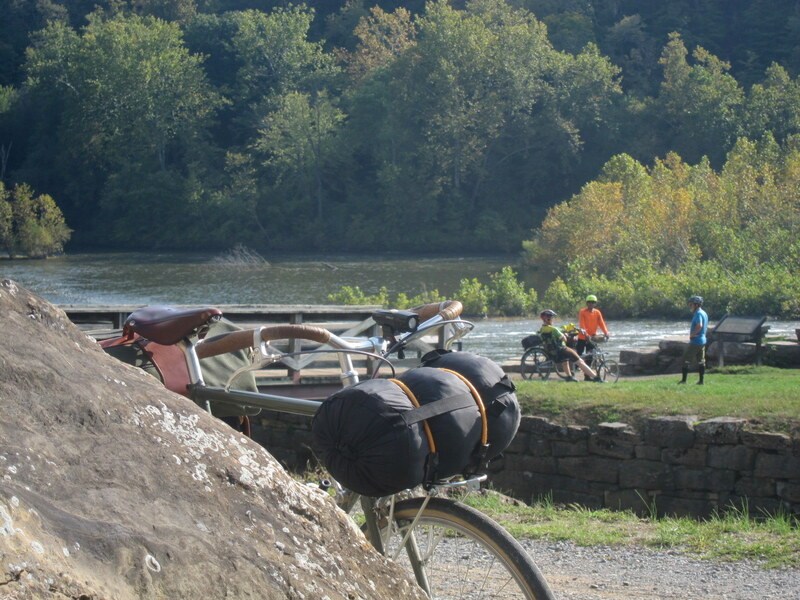 The plan was to ride (and lollygag) the C&O until we ran out of time on Friday. 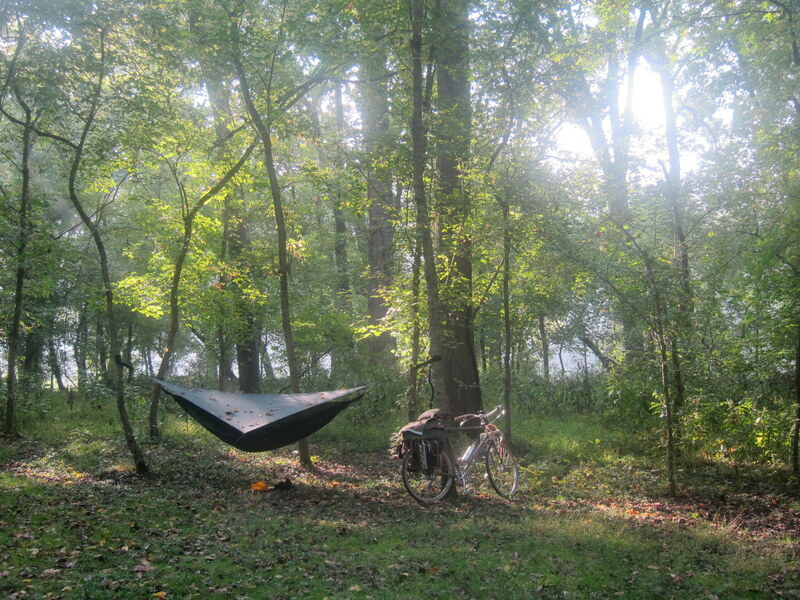 I had shipped my bike to Washington, D.C. via Amtrak, and it arrived before I did. Many thanks to Shawn Granton for the tip. It worked out fine in both directions. 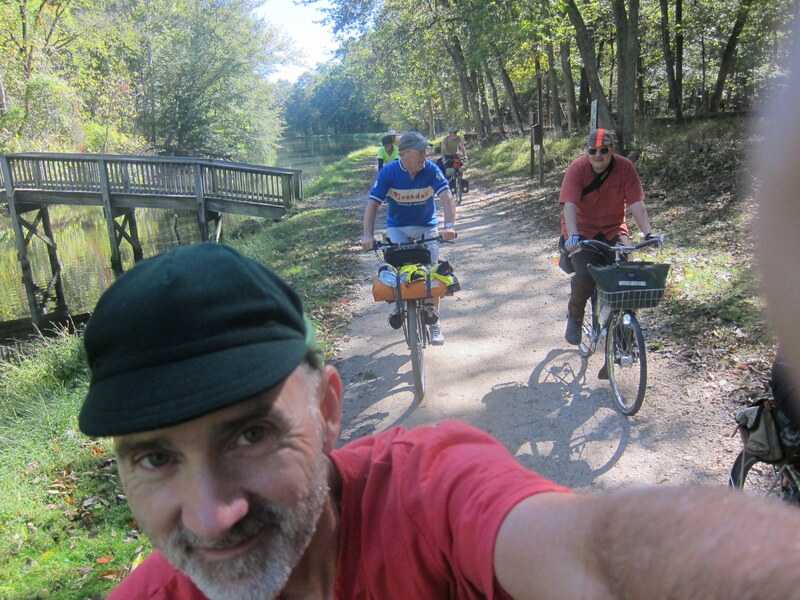 While scheming, I posted to the Rivendell Bicycle Works Google Group that I’d be in the DC vicinity and would love to meet some of the locals. I pointed out that my itinerary was inflexible and our tour would be entirely during the work week, but the locals demonstrated amazing hospitality and many joined for part of our tour. Some for a few miles on the first morning, and some for the first overnight. The locals must have been desperate to escape work, or the excellent local logistics planning skills of Tony DeFilippo won them over. I think there were ten of us at the trail meet-up. It was a joy to meet everyone, and an honor to have folks make the time to be a part of something so special for us. As the day grew older, most folks had to turn back to real life. Only two guys (Jeff and Tom) finished the day and set-up camp with us. However, John read my RBW Group post that we were coming his way. He couldn’t ride with us, but he did ride out to the campsite on his Quickbeam and entertained us with stories as we set up. Thanks, John! On Wednesday morning, Jeff turned back and only Tom remained with us. 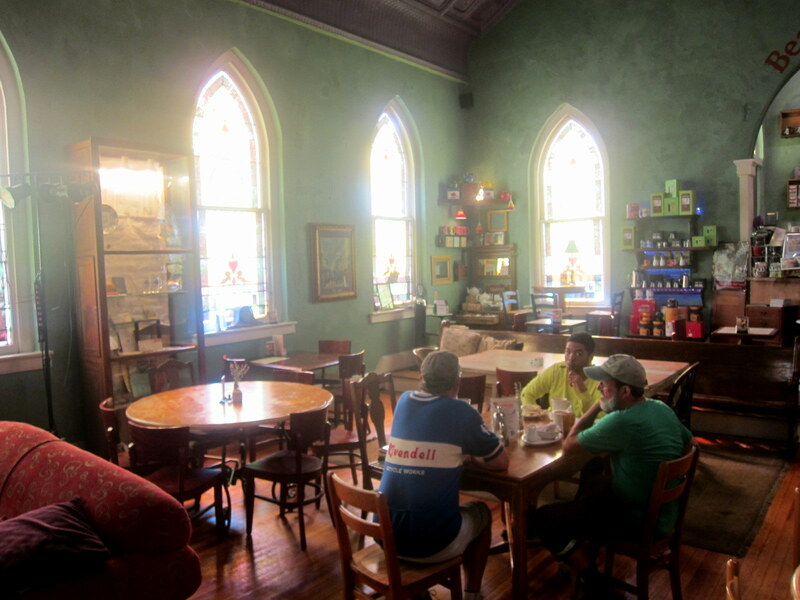 We stopped to refuel at a place that had been recommended in Brunswick called Beans in the Belfry. With such good food and atmosphere, it is easy to understand the high recommendations. Finally, at Harpers Ferry, Tom dropped off and only the three-man nucleus remained. Since I know Steve and Carey so well already, much of our conversation related to what we were seeing and experiencing. 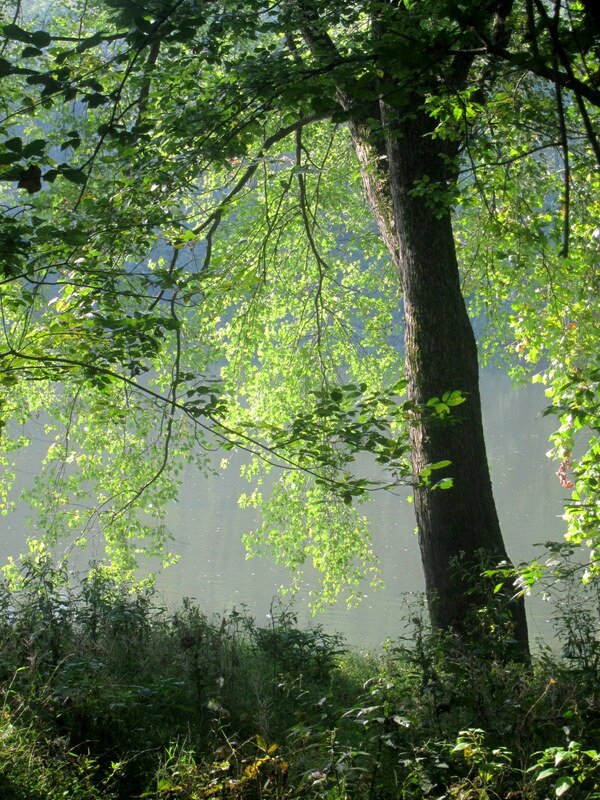 The light and the leaves caught much of my attention as I pedaled the trail. Wednesday was a relatively short pedaling day. 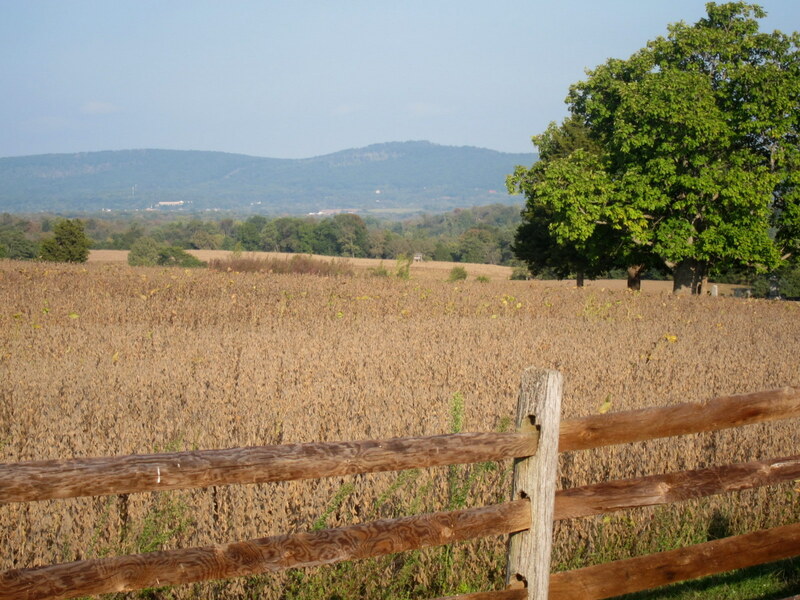 We ended up in Sharpsburg where our wives and my grandson joined us for a carriage tour of the Antietam Battlefield, dinner, and a luxurious night stay at a BnB. On Thursday morning the three guys returned to the trail. 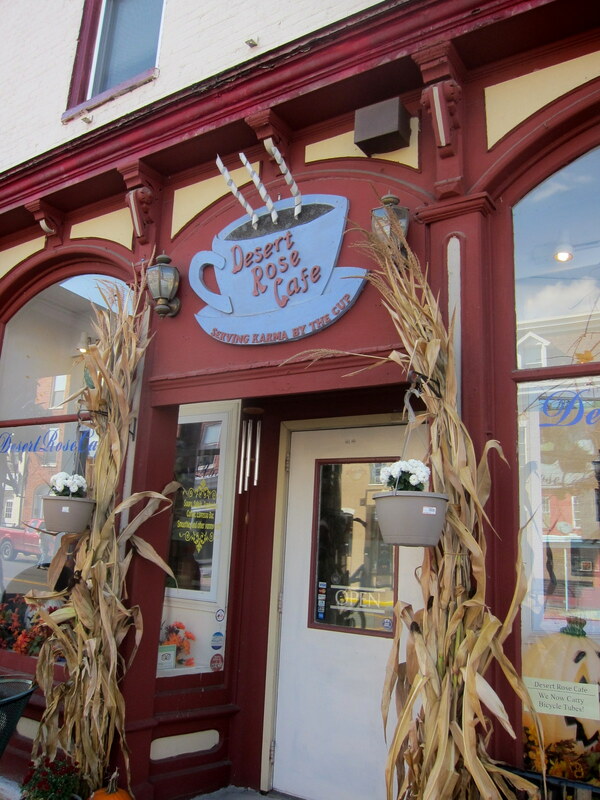 We found another great refueling stop in Williamsport called The Desert Rose Cafe. It was a popular spot for Trail cyclists. 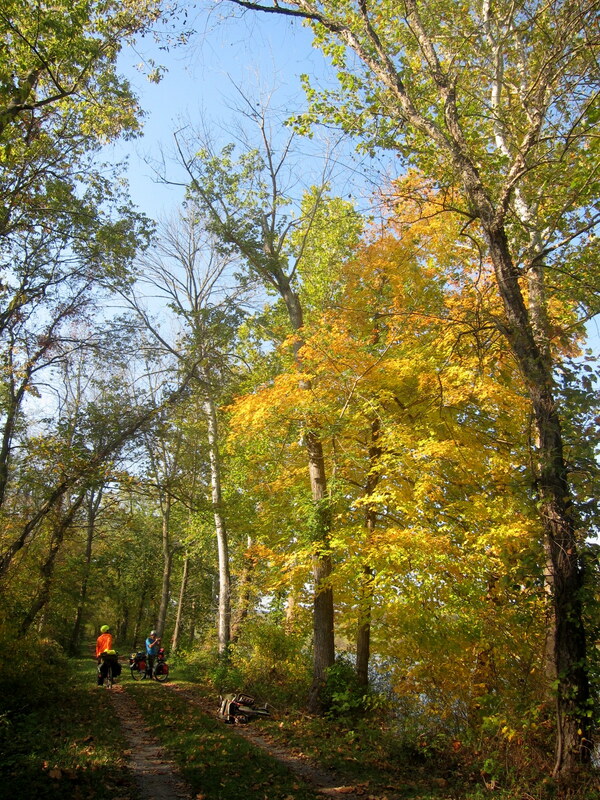 Then we enjoyed more light and leaves, the Potomac River rolling by, and the fall color seemed to suddenly emerge in a visible way. 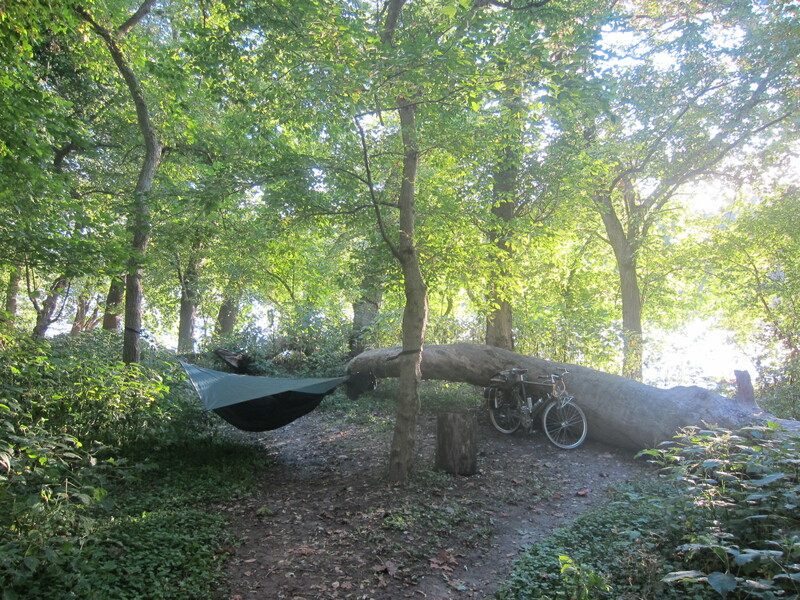 We found another excellent campsite for Thursday night. 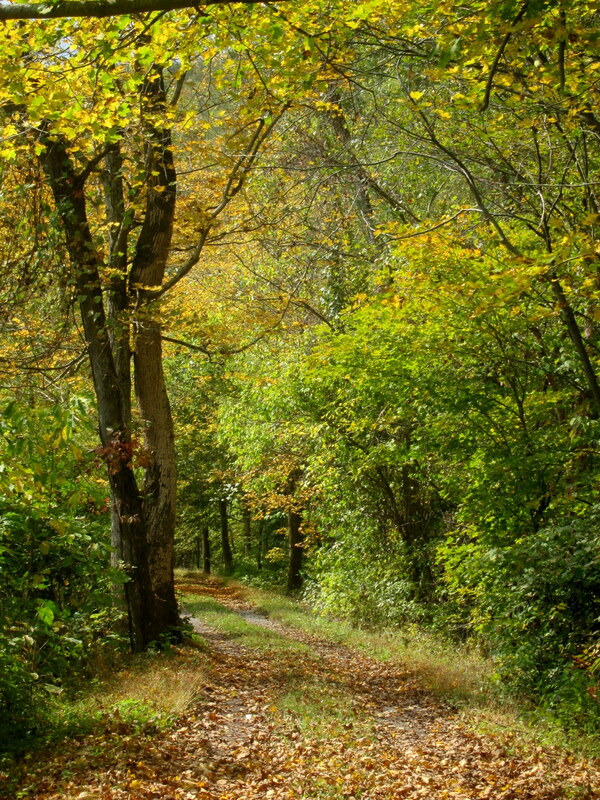 On Friday, we enjoyed more quiet miles along the trail in comfortable Fall weather. 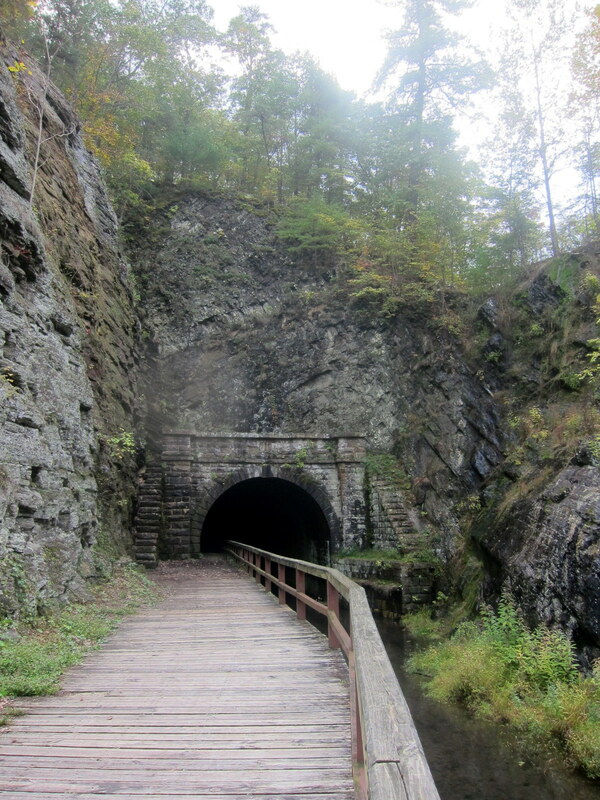 By the time we crossed the Paw Paw Tunnel, we knew that we’d not make it all the way to Cumberland. Our wives/grandson support crew were to pick us up and return us to Silver Spring that evening. We finished our tour at Oldtown contented and grateful for all that we had been able to experience in these four days. Tuesday, Wednesday, Thursday, and Friday. I estimated that we covered (and truly experienced all) 198 miles. Many more photos of the tour are HERE. Thanks for the facts & wonderful photos. Fall is truly a special time for touring. Now we look forward to your impressions, although “just the facts” contain a lot of impression right there. Thanks, Doug, for the encouragement. I’m pondering some kind of “impressions” post. Even though it will not be adequate, there are things that probably should be said. So the chances of such a post are probably more than 50/50 for now. Yowza – what a tour, Chris! 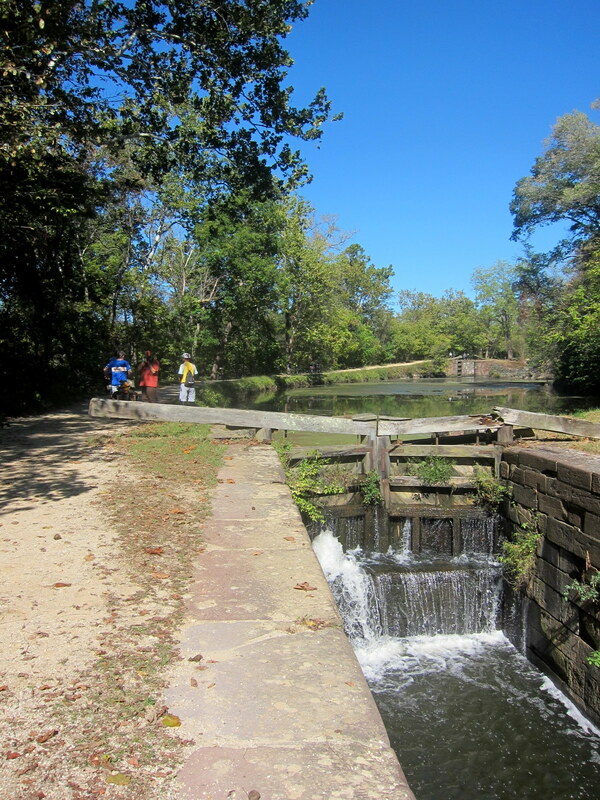 Chris, fantastic that you and your buds were able to ride the C&O. Close to the top of my cycling bucket list. If the opportunity presents itself again for you, I’d be interested in joining up. Thanks, Richard! With a grandson in the area, who knows? Maybe I’ll be able to do something out that way again one day.